Drugs can be useful to gain temporary benefits of various sorts, but can lead to harmful addictions, negative side effects, and even overdose resulting in permanent ailments or death. Most drugs are crafted at the drug lab using either psychoid leaves or neutroamine. Beer, however requires hops and has an intermediate stage before fermenting called wort. 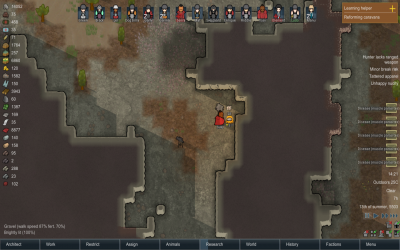 If you want to avoid drugs in your colony, you have the option of burning them at a campfire or crematorium, or forbidding them and selling them to a trader which is lucrative on the market. Binging pawns will take drugs even if they're forbidden though. Burning drugs to prevent policy breakers from overdose. The effects of drugs are modulated by body size, so smaller creatures need less beer to be drunk than bigger animals such as the Thrumbo. Drugs can be assigned for regular taking through the drug policy system. Similar to Outfits, drug policies are an assigned schedule for taking drugs. You can set any number of drugs, each with a frequency. For example, you can assign a colonist to drink 2 beers every day, and take one Penoxycyline every 5 days. You can also toggle to use the drug to feed an addiction, separately from joy usage. Drugs can also be administered through a medical operation. Animals may take drugs on their own if they are within their allowed areas. Addictions are a sad reality that most drug-using colonies must face. Without a continuous supply of drugs, withdrawal symptoms will kick in and your poor colonist will suffer. Luciferium has an instant addiction. Once taken, it will need to be taken regularly. Otherwise, the withdrawal from it will cause all sorts of mental breaks, eventually including death. Tolerance is the value related to addiction upon consumption of any drugs. It has a fixed buildup amount for each drug, and decreases each day afterwards. Colonists will have a chance of getting addicted once they cross a certain tolerance threshold. Safe consumption of drugs can be set in the restriction tab for drug usage. When tolerant, the severity given per dose of the drug will decrease by a fixed amount, meaning that they will last shorter, and colonists will need to consume more of them. Addiction also has the same effect, in addition to requiring the pawn get a regular dose of the drug to prevent withdrawal. 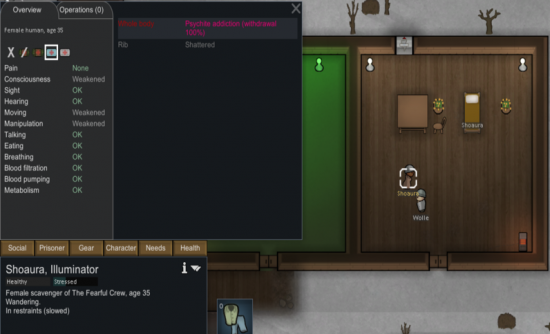 Colonists with either the Chemical Interest or Fascination traits as well as addicts may randomly have drug binges. Such colonists will ignore drug policies. This can cause a relapse from getting those colonists clean. Colonists can't take drugs that they can't reach. A drug binging colonist without access to that drug will only wander around until their senses are restored. Other withdrawal-based mental breaks are another story. To destroy drugs, you can burn them at a campfire. You can also sell them to passing traders that are interested in buying, or have a non-binging colonist take them away on a caravan. One alternative to keeping drugs out of the hands of binging addicts is to place the drugs in a room and board up the entrance. This could also be done to the addict by trapping them but will become counterproductive once they become hungry. Another alternative, which may be quicker depending on the case, is to load the drugs in a transport pod and keep them there until the binge is over. Instead of keeping the drugs from the addict, you can keep the addict from the drugs by imprisoning them and keeping them there until they're clean. Imprisoning them also contains the impacts of their mental breaks. You can arrest an addicted colonist by drafting another colonist and right clicking on the addict. Using force can have a negative social influence on the patient and increased mood debuffs that will make recovery even harder, especially if such measure was performed with weapons (healing will take longer and could injure the body badly). It may be best to wait until the pawn collapses due to exhaustion or starvation, then arrest them without the possibility of a physical intervention. If it must be done while they can stand, then it's wise to disarm this colonist before attempting to arrest them as they may resist and go berserk. Chatting with the imprisoned while they're getting clean will help train your warden's Social skill. Still, arresting any colonist will give them the accompanying thoughts of being imprisoned both during and afterward. This also works great for addicted prisoners as they're already imprisoned. It is recommended to keep them in their own cell though. Otherwise, they can go berserk and attack other prisoners. If you want to recruit such an addict, it's recommended to get them clean before recruiting. There's no use in releasing an addicted new recruit, only to throw them right back in their cell very soon. You can avoid the berserk state of a "drug rehab inmate" by removing his/her two legs, that way they will lay on their bed until the drug withdrawal completes. Just replace the pawn's legs with peg legs and then remove the peg legs. Once recovered, you can install two bionic legs. Keep an eye on your technological level and make sure you have bionic legs at your disposal. Withdrawal will make the person feel a great mood drop and impair their stats, depending on the addicted drug. Once the withdrawal passes away, the colonist will feel good as new. During this time, you may want to give your colonist more time to enjoy himself. Giving him social drugs may help depending on the situation, but remember never to feed his addiction as this resets the withdrawal countdown, unless he's addicted to multiple drugs at the same time, in which it may be easier to deal with 1 drug addiction at a time. On the other hand, if they become incapacitated when the withdrawal symptoms hit all at once, it may be better to leave them like that, as they are unable to have mental breaks or such during the withdrawal period. The health overview tab which will display a counter with withdrawal percentage. The higher it gets, the closer to complete recovery (100%, though 99.5% is rounded to 100% in display). Using the healer mech serum instantly treats addictions if there are no other serious health problems affecting the addict. This gives a convenient but somewhat costly way to bypass the lengthy withdrawal period. A synthetic combat drug developed for space marines during the early days of interplanetary warfare. Go-juice blocks pain and increases the user's melee and shooting abilities. It also enhances movement speed. Military chemists who created it were never able to remove its addictiveness. Some saw this as a downside; others saw it as a benefit. A concoction of advanced glitterworld mechanites that dramatically improve the body's functioning in all respects. Unfortunately, without the moderating effects of regular doses every five or six days, the mechanites lose cohesion, causing continuous berserk rages and, eventually, death. After the first dose, there is no way to get the mechanites out, ever. On the urbworlds, they call Luciferium the 'Devil's Bargain'. Many have been forced to kill friends when no more of the seductive red pills could be found. A drug for blocking various infections. Blocks malaria, sleeping sickness, and plague. Take every 5 days. A flaky substance that can be smoked to induce a short but powerful euphoric state. While it is cheap to produce, it is exceptionally addictive. A fine white powder snorted to produce a euphoric high. Yayo reduces the user's need for rest, and suppresses pain. It is, however, addictive. A fragrant tea which can be drank to induce a weak euphoric effect. Very easy to produce, but be wary of addiction..
Smokeleaf leaves prepared in small rolls for smoking. The drug improves mood, but also increases appetite, reduces focus, and slows movement. Smokeleaf use can produce a dependency. Can be produced without equipment, at a crafting spot. An addictive stimulant. Fills the need for rest, and allows users to work for extended periods without getting tired. Addiction causes reduced mental performance and, sometimes, psychotic breaks with reality. This page was last edited on 27 February 2019, at 20:07.